We are conveniently located in the Danny B. Hicks Municipal Complex. Parking is available in front of the Police Department on 2nd Street North and also on 3rd Ave. East in front of Oneonta City Hall. 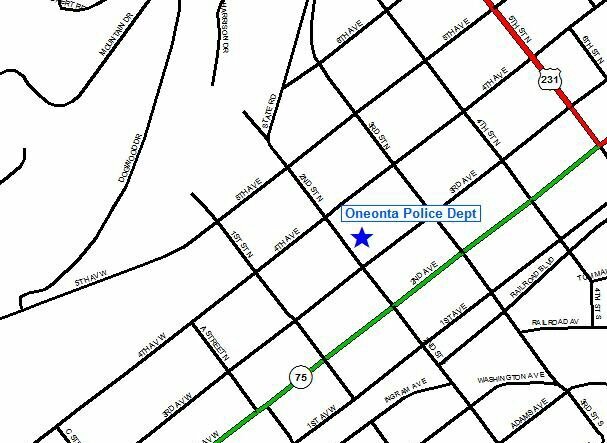 The front office of the Oneonta Police Department is open 8 AM until 4 PM Monday thru Friday(excluding holiday) to serve you. Our patrol division is available 24 hours a day 365 days a year for any calls for service. Alabama Highway 75 North into Oneonta. Turn Left at the first red light onto 2nd Street. We are located on the right hand side of the road. Alabama Highway 75 South into Oneonta. Turn right onto 2nd Street. We are located on the right hand side of the road. U.S. Highway 231 North to the intersection of Alabama Highway 75. Turn left onto Alabama Highway 75, turn right onto 2nd Street. We are located on the right hand side of the road. Alabama Highway 160 East to U.S. Highway 231 South. Continue on U.S. Highway 231 South to the intersection of Alabama Highway 75. Turn right onto Alabama Highway 75. Turn right onto 2nd Street. We are located on the right hand side of the road.